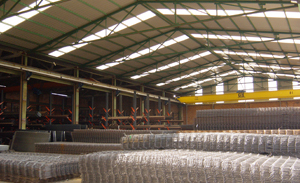 Cortés S. L. has positioned itself as a leader in central Catalonia, with a national and international projection unbeatable in the distribution of steel-related products. The firmness of a structure depends on its skeleton. We provide the service. Delivery, quality and the best service differentiate us from the competition, add value to our work. S. L. Cortés Irons shop belongs to SIDECO, which includes stores statewide. This allows us to offer the best value in all our products. By agencies and departments of the Government, Cortés Irons maintains business contacts with international suppliers for diversifying and flexible commercial supply of raw material. This facilitates us to meet all the needs of our clients without compromising product quality. 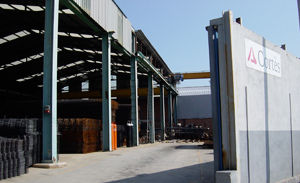 +More than 10,000 m2 dedicated to metal trade. 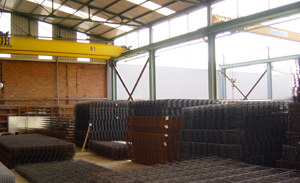 + Machinery lifting (overhead cranes). + Band saw to cut beams up to 700mm wide. + Large fleet of trucks for distribution. + Cut and assemble machinery for construction corrugated bars. + Material in stock: delivery within a maximum of 48. + Automatic machine for cutting rebars from roll. + New plant for cutting and assembly of corrugated Gironella. Cortés's origins date back to 1960, when Juan Cortes and Singla, born in Mura, began to engage in the supply of steel products in the basement of the house where he lived, in the Plaza Lladó of Manresa. With little time grew and it became necessary to move to a larger space and storage Ótimas conditions, logistics and distribution. In 1973 he built the present warehouse of Sant Fruitós de Bages and Montserrat Cortes and Carol and her husband Josep Solé and Lafo, took over the company. Then began a period of progress in which improved the facilities of the ship in order to meet demand increasingly important and challenging, as a result of quality management and diligence in deliveries generated by those responsible for the new business stage. The strong involvement of the company in the supply of iron to build Josep Solé moved Estany and family create Irons preformed in 1992, a new company located in the industrial plant Las Virgenes of Santpedor. Cortés is continuing its expansion by acquiring in 2004 Hierros y Armaduras of Gironella, responding to the growing demand for northern Catalonia.